Lauren Clem kicks the ball. The senior goalkeeper was named Big Ten Defensive Player of the Week on Tuesday. Senior goalkeeper Lauren Clem was named Big Ten Defensive Player of the Week and freshman forward Kayleigh Stahlschmidt earned freshman of the week honors, the conference announced Tuesday. Both played key roles in Northwestern’s 1-0 win over Nebraska on Saturday. Stahlschmidt came off the bench to score the lone goal, the first of her career, while Clem made three saves to keep her eighth clean sheet of the season. Clem won her award for the second-straight week, continuing an excellent late-season stretch. Her shutout against Nebraska was her third straight, and she moved to fifth in NCAA history with 45 career clean sheets. 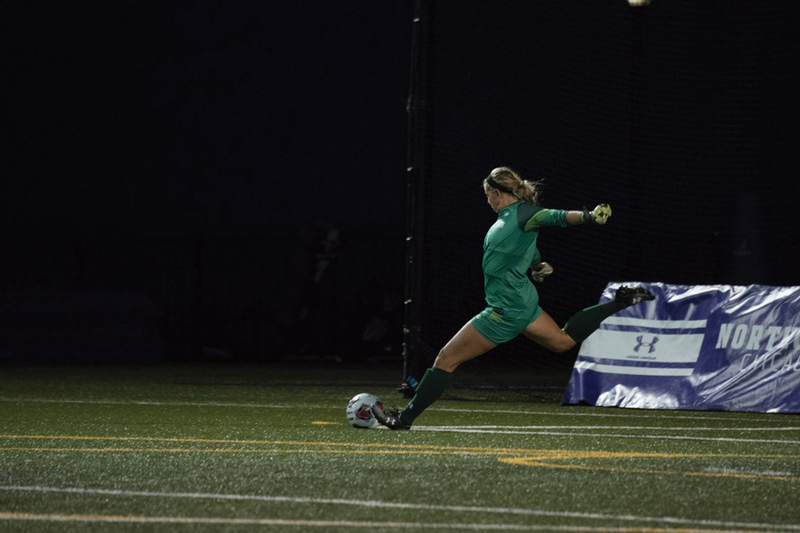 She has now held opponents scoreless for 291 consecutive minutes, a period reminiscent of her 2016 campaign, in which she conceded just seven goals all season and led the nation in save percentage. Still, despite her individual success, Clem said earlier this month that clean sheets involve far more than just herself. Stahlschmidt, meanwhile, took advantage of a scramble in the box in the 65th minute, tapping a loose ball into the net after junior defender Kayla Sharples outjumped the Cornhuskers’ goalkeeper. She has appeared in 12 games this season off the bench, but entered Saturday’s game with just two shots on goal and one assist. The win was significant for the Wildcats, who have won three straight games to charge up the Big Ten standings after a slow start to the season. NU now sits third in the conference ahead of its regular season finale at Michigan State on Wednesday.